Our daughter Angel has been dating her boyfriend Seth for over 3 years. They met while our two families lived in Omaha. When Seth and his family moved to Colorado, Angel moved out to be near him a few months later. Seth proposes to Angel in front of Cinderella’s Castle at Magic Kingdom DisneyWorld. A couple of weeks ago Seth called Aunesty and asked for permission to marry Angel and also asked for help in planning the proposal. Angel’s dream has always been for a proposal to happen at Magic Kingdom, specifically at Cinderella’s Castle, so the mission was on to figure out the perfect way for Seth to pop the question. At first, Aunesty thought of a few different types of flash mobs to dance and perform. This morphed into asking several of our readers and other Disney blogger readers to hand out flowers along the way from Fantasyland to the Castle where Seth would be waiting. This was all going to happen on Valentine’s Day, too. However, Angel is somewhat nosy. She kept checking Seth’s phone for conversations between Aunesty and himself. She would check around his room for any types of “boxes” that may contain a ring. So, their trip down here this past week she seemed to think something was forthcoming. Seth come up with the idea to change the date from Valentine’s to a day earlier to surprise her as much as possible. It was decided Seth would ask her during one of the Dream Along with Mickey shows in front of Cinderella’s Castle. Specifically, during the part when Mickey and the entire crowds would be chanting “dreams come true”, Seth would ask Angel to marry him. Now that the time was set, the logistics of making the videos and sneaking the ring in the park were up next. I carried the ring in my pocket (the box was huge!). The kids – Angel, Seth, and Becca – all went into the park before us and staked out a spot in front of the castle. Aunesty and I lagged behind and stopped by Town Hall to pick up a couple of Just Engaged pins. We met up with the kids and waited for the show to start. It couldn’t have worked out more perfect. As the crowd chanted, “dreams come true” Seth dropped to one knee and asked for Angel’s hand in marriage. Although Angel kind of knew the moment was coming at some point, you could tell she was surprised. As tears streamed down here cheeks, she just nodded her head telling Seth “yes”. It was an incredible moment and we couldn’t have been happier how it turned out for both Angel and Seth. After the evening was over, we rushed home to see the picture and watch the videos we took of the moment. We were able to capture not only the proposal but also people’s reactions around us when it was happening. Two teenage girls mouths literally dropped seeing Seth going down to one knee. People in the background were taking pictures of the couple after they put on their bride and groom Mickey ears (monogramed with their names, of course). The sound of the Dream Along with Mickey show seems to sync up with the moment perfectly which only added to the special moment. As if getting engaged in front of Cinderella’s Castle wasn’t enough, a Disney cast member came over to Angel and Seth after the show was over and asked if they’d like to go behind the stage as some “friends” wanted to congratulate them. Apparently, Snow White and the Snow Prince had seen the entire proposal happening while they were on stage performing the show and wanted to personally wish their best to the happy couple. As it turns out, Snow White is Angel’s favorite Disney princess so the moment only got better! 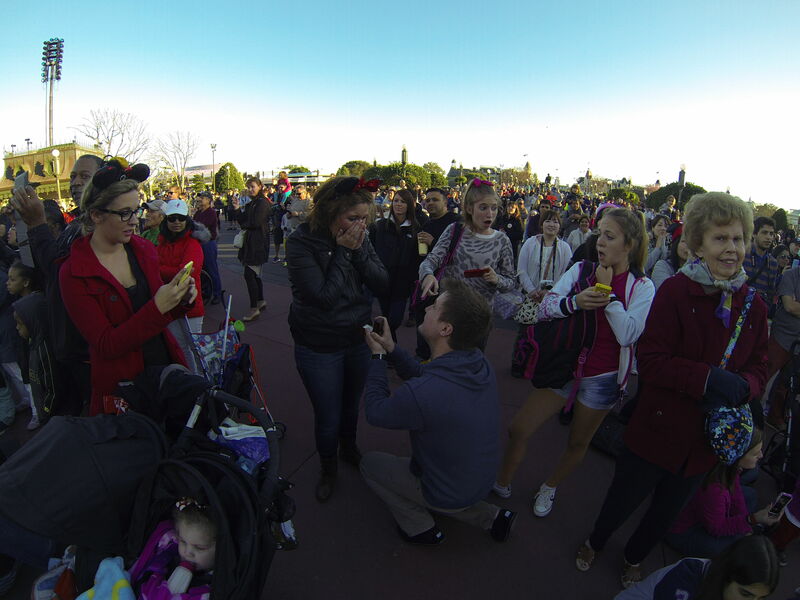 At the end, Angel’s got her wish: to be proposed to by Seth in front of Cinderella’s Castle at Magic Kingdom. A very simple proposal but at the right place and at the exact right time to make the moment even more special. Mickey’s right: dreams do come true! Congratulations fo the happy couple. Thanks for sharing this great moment.